This article is about the American film. For the South Korean film, see Always (2011 film). 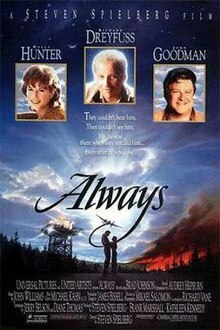 Always is a 1989 American romantic comedy-drama film directed by Steven Spielberg, and starring Richard Dreyfuss, Holly Hunter, John Goodman, Brad Johnson and Audrey Hepburn in her final film role. Always is a remake of the 1943 romantic drama A Guy Named Joe set during World War II. The main departure from the 1943 film is the altering of the setting from WWII to that of a modern aerial firefighting operation. The film, however, follows the same basic plot line: the spirit of a recently dead expert pilot mentors a newer pilot, while watching him fall in love with the girlfriend he left behind. The names of the four principal characters of the earlier film are all the same, with the exception of the Ted Randall character, who is called Ted Baker in the remake, and Pete's last name is Sandich instead of Sandidge. Pete Sandich (Dreyfuss) is an aerial firefighter, flying a war-surplus A-26 bomber dropping fire retardant slurry to put out forest wildfires. His excessive risk taking in the air deeply troubles his girlfriend, Dorinda Durston (Hunter), a pilot who doubles as a dispatcher, and is also of concern to his best friend, Al Yackey (Goodman), a fellow fighter. On one flight, Pete makes one extra drop, runs out of fuel, and barely manages to glide onto the runway. Pete shrugs off his brush with death and surprises Dorinda with a stunning white dress for her birthday, although it turns out to be the wrong day. Irate at first, she eventually puts on the dress anyway, and the couple dance to their song, "Smoke Gets in Your Eyes". Al sits Pete down for a beer and likens their situation to wartime England (Quonset huts, beer, and hotshot pilots flying bombers) in order to emphasize the key difference: "Pete, there ain't no war here. And this is why you're not exactly a hero for taking these chances you take." Al suggests Pete take a safer job that has just opened up, training firefighting pilots in Flat Rock, Colorado. Pete flatly refuses to consider it. However, when Dorinda confronts Pete and tells him that she hates worrying about him all the time, he decides to take Al's advice. Pete takes one last mission, despite Dorinda's gloomy premonition. While on a bombing run, Al's Catalina water bomber hits a burning tree and an engine catches fire. When Al's fire suppression equipment fails to put it out, he appears doomed. In desperation, Pete makes a dangerously steep dive to skillfully douse the engine with slurry. He saves Al, but in trying to recover from his dive, his bomber flies through the forest fire. Pete manages to pull up and climb back up to a safe altitude beside Al, but a small engine fire spreads to his fuel tank, and his aircraft explodes. The next thing he knows, Pete is walking through the burnt-out forest. Soon, in a forest clearing, he meets Hap (Hepburn), who explains to Pete that he is dead and that he now has a new purpose: just as he himself was inspired by others throughout his life when he needed it most, it is now his turn to provide Spiritus ("the divine breath") to others. As she puts it, "They hear you inside their own minds as if it were their thoughts." Six months have elapsed in the real world. Pete is assigned to guide a new firefighting pilot, Ted Baker (Johnson). To Pete's anguish, Ted falls in love with Dorinda, and she begins to respond and recover from her mourning. Pete tries to sabotage the growing relationship. The next day, Pete wakes up back in the forest with Hap. She reminds him his life is over, and also he was sent back not just to inspire Ted, but to say good-bye to Dorinda. Ted, with Pete's inspiration, puts together an extremely dangerous mission to rescue a ground crew of firefighters surrounded by flames. Unable to bear the thought of losing another loved one, Dorinda steals Ted's aircraft to do the job herself. Pete, unseen to Dorinda, tries to talk her down, but she will not listen. Dorinda completes the dangerous task, with Pete's unseen help. On the way back, he tells her all the things he wanted to say, but never got around to while he was alive. Dorinda is forced to make an emergency water landing on the lake. As the aircraft sinks into the lake and the cabin fills with water, Dorinda appears reluctant to try to escape until Pete appears before her, extending his hand. She takes his hand and they swim to the surface. As Dorinda wades ashore (now alone) to the waiting Ted and Al, Pete releases her heart so that Ted can take his place, saying, "That's my girl ... and that's my boy." As Dorinda and Ted embrace, Pete smiles and walks the other way down the runway to take his place in Heaven. Principal photography began on May 15, 1989. Production took place in Kootenai National Forest, Montana, with some scenes filmed in and around Libby, Montana. Some 500 people from nearby Libby were recruited for the film as extras to act as wildland firefighters. The scenes where the plane flies over the lake at the beginning and lands in the lake at the end of the movie were filmed at Bull Lake. The scenes set in "Flat Rock, Colorado" were filmed at and around the Ephrata airport in eastern Washington. The scene where Pete and Hap are walking through the wheat field was filmed at Sprague, Washington where they spent two weeks filming in June. Footage of The Yellowstone National Park's 1988 fires was used for the fire sequences. Sound stages were also used at Universal Studios in Los Angeles, California. Production wrapped in August 1989. Hepburn retired from acting and died in 1993. A number of other aircraft also appeared in Always: Aeronca 7AC Champion, Bellanca 8KCAB Super Decathlon, Beechcraft Model 18, Cessna 337 Super Skymaster, Cessna 340, Consolidated PBY-5A Catalina, de Havilland Canada DHC-6-300 Twin Otter, Douglas C-54 Skymaster, Fairchild C-119C Flying Boxcar, McDonnell Douglas DC-10 and North American B-25J Mitchell. Two helicopters were also seen: Bell 206 JetRanger and Bell UH-1B Iroquois. Always opened at #5 at that week's box office, grossing $3,713,480, competing with Christmas Vacation, Tango & Cash (opening the same weekend), The War of the Roses and Back to the Future Part II. Although now considered only a modest financial success when compared to other Spielberg ventures, the film brought back returns grossing $43,858,790 in the U.S. and $30,276,000 on foreign territories, for a $74,134,790 worldwide total. Roger Ebert of the Chicago Sun-Times considered it "dated" and more of a "curiosity," calling it Spielberg's "weakest film since his comedy 1941". Variety gave it a more generous review: "Always is a relatively small scale, engagingly casual, somewhat silly, but always entertaining fantasy." The film has received a 67% rating on Rotten Tomatoes based on 24 reviews. Always was nominated in 1991 for the Saturn Award as Best Fantasy Film, while Jerry Belson was nominated for the Best Writing category of the award at the Academy of Science Fiction, Fantasy & Horror Films (USA). A number of critics have now considered the film as the progenitor of a new crop of "ghost" genre films, including Ghost (1990). The character Pete Sandich, played by Richard Dreyfuss, whistles "Garryowen" and the theme to Leave It to Beaver. "Smoke Gets in Your Eyes," performed live in the film by J. D. Souther and played later on tape by The Platters, is what romantic couple Sandich & Durston refers to as "our song". ^ Originally intended to be an MGM project, the film underwent a protracted 10-year gestation, with Tom Cruise reputedly being considered for the Ted Baker role. ^ A noticeably frail Audrey Hepburn appeared in Always in her last film role. Her cameo was an opportunity to raise money for her favourite cause; much of Hepburn's one million dollar plus salary was donated to UNICEF. ^ A combination of aerial photography, rear projection and models was used to create the aerial sequences. ^ a b c d "Always". American Film Institute. Retrieved December 6, 2016. ^ a b boxofficemojo.com. "Always". Accessed 26 February 2016. ^ Evans 2000, p. 97. ^ a b " 'Always' (1989)." imdb.com. Retrieved: December 27, 2010. ^ "Always (1989) Full credits." IMDb. ^ a b c d Ebert, Roger. " 'Always' review" Chicago Sun Times, December 22, 1989. ^ Freer 2001, p. 183. ^ "Steven Spielberg as a Role Model." rolemodel.net, 2007. Retrieved: December 5, 2009. ^ "Steven Spielberg." Archived 2007-12-12 at the Wayback Machine ambidextrouspics.com. Retrieved: December 5, 2009. ^ Walker 1997, p. 271. ^ Woodward 2010, pp. 361, 390. ^ "N9425Z." faa.gov. Retrieved: December 5, 2009. ^ "N4818Z." faa.gov. Retrieved: December 5, 2009. ^ Farmer 1990, p. 35. ^ "Filmography – Steve Hinton." IMDB. Retrieved: March 13, 2007. ^ "Filmography – Dennis Lynch." IMDB. Retrieved: March 13, 2007. ^ Freer 2001, p. 186. ^ Kurtz, Andy. "Directors Hall of Fame." bullz-eye.com, February 5, 2007. Retrieved: December 5, 2009. ^ " 'Always' (1989) Review." Variety. Retrieved: December 5, 2009. ^ rottentomatoes.com. "Always (1989)". Rotten Tomatoes. Retrieved February 26, 2016. ^ Jacobson, Colin. " 'Always' 1989 Review." dvdmg.com. Retrieved: December 5, 2009. ^ " 'Always' (1989)." rottentomatoes.com. Retrieved: December 5, 2009. Crawley, Tony. The Steven Spielberg Story. New York: William Morrow, 1983. ISBN 0-688-02510-2. Evans, Alun. Brassey's Guide to War Films. Dulles, Virginia: Potomac Books, 2000. ISBN 1-57488-263-5. Farmer, James H. "The Making of Always." Air Classics, Volume 26, No. 2, February 1990. Freer, Ian. The Complete Spielberg. New York: Virgin Books, 2001. ISBN 0-7535-0556-8. Sinyard, Neil. The Films of Steven Spielberg. London: Bison Books, 1986. ISBN 0-86124-352-8. Walker, Alexander. Audrey: Her Real Story. London: Weidenfeld & Nicolson, 1997. ISBN 978-0-31218-046-1. Woodward, Ian. Audrey Hepburn: Fair Lady of the Screen. London: Virgin Books, 2010. ISBN 978-0-8636-9741-8.